A a miniature Tap and Die Set, used in Jewelry making and Watch repair made to be used with soft precious metals (For use with Gold, Silver, Copper and Brass). Set can be used for making both internal and external threads on small parts. Set comes with fourteen different taps and a matching screw-plate along with a 4" pin vise. The range of this set is from 2.00mm down to 0.7mm for threading wire or re-threading stripped threads on screws. 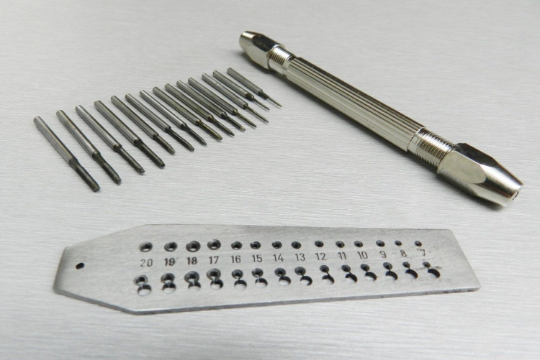 A handy economical Tap & Die set, made in India. Set can be used to thread wire, for re-threading of stripped threads on screws, earring backs and watch repair parts. Screw-plate (Die) is used for threading wire or making your own screws, while the individual taps are used with a pin vise. Always use a cutting fluid when using the Taps and Plate/Die, turn a few threads and reverse slightly to remove the metals that have been cut. The proper use will ensure the taps and die-plate to last longer.